Avaaz - G8+5: FEEL THE HEAT, ACT NOW! G8+5: FEEL THE HEAT, ACT NOW! Petition To World Leaders: Climate change is the greatest threat facing our world today - and we are almost out of time to stop it. You must tackle this problem now, decisively and together. Start working toward a new global agreement this year. Set binding global targets for emissions to avert catastrophic climate change. Take bold action immediately - and we will join our efforts with yours. 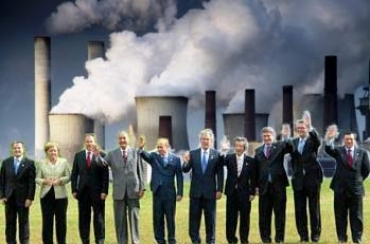 From 6-8 June, the leaders of the biggest polluting countries in the world are meeting in Germany at the G8+5 summit. Between them, their countries produce over 70% of global warming emissions. But while climate change is the top issue on their agenda, the Bush administration is trying to prevent any serious commitment to action. Your voice is needed now to tell world leaders to stand strong on climate change. Sign our petition to send a message that the world is calling for action to avert a climate catastrophe.